October 14-20 is a busy week for us here at the Castro Valley Library. That’s because it’s Teen Read Week. 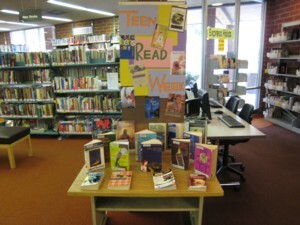 Come on in and check out our Teen Read Week display, where you’ll find an eclectic collection of books aimed for teens. Everything from graphic novels, to popular teen fiction, to the “classics” that are assigned in school, is just waiting here to be checked out. Also for teens, this Saturday, October 20th from 2:00-4:00 we will be hosting a Dreams Interpretation workshop which will be led by local Renaissance man Steve Klitzing. In this program teens (and adults) can have the mysteries of their dreams unraveled. Does your constant dreaming of Brad Pitt mean he’s going to leave Angelina for you? Is that dream where you’re falling down an endless pit a sign of impending doom? Bring 1 personal dream to the program and Mr. Klitzing will help you to analyze and better understand your dream.